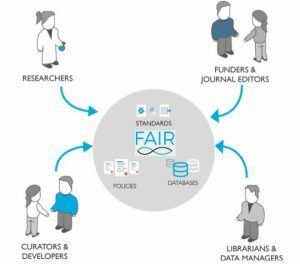 An important article has been published in Nature Biotechnology about the work of FAIRsharing.org, a curated registry of data and metadata standards, databases and policies intended for a variety of users in the research space. FAIRsharing tracks the evolution of how these resources interrelate by working closely with research communities, standards creators and repository providers. The result of this is not just the registry but also a set of tools and services to aid discovery. Originally the registry focused on biomedical resources but has expanded beyond this discipline into others, and encourages the development of FAIR guidance and maturity models. As part of the FAIRhsharing community, Jisc is pleased to support this critical work. Community led initiatives are essential to create shared understanding of best practice in research disciplines. Last year Jisc commissioned a report to look at how UK research communities understood and implemented the FAIR principles. The report – Fair In Practice – found that, in general, adoption of FAIR was limited, or interpreted as existing practice. What became clear is that there were areas where responsible research data management was mature but many others where it was not. FAIRsharing is providing a means of exposing that best practice to others, be it within or across different research groups and disciplines. In addition to these community benefits, there are also technical opportunities to leverage. The Jisc Open Research Hub has been built with the FAIR principles in mind and is able to utilise this registry. The service supports and encourages the linking of research outputs via persistent identifiers and FAIRsharing’s work around making its curated resources citable enables its resources to be linked to new research outputs. This can add much needed context to explain where data has come from and which standards have been used in its presentation. Making the Open Research Hub FAIR is ongoing work and recently, a proposal has been made as to how the FAIR principles can be used to improve metadata coverage and completeness in the repository submission workflow. 2) those who produce policies can improve discoverability, adoption and citation of their resources. Do you have an example of how the FAIR principles are being applied in your work? Please leave a message below as Jisc would love to hear about best practice and innovation in this area. ← Research data: To keep or not to keep?